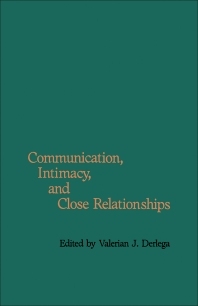 Communication, Intimacy, and Close Relationships offers an account of the nature of intimate relationships and their effects on people's self-concepts. The development and maintenance of intimate relationships are examined, along with people's motives and goals in pursuing intimacy; the nature of social exchanges in intimate relationships; and the consequences for individuals who find themselves socially isolated. The critical role of communication in intimate relationships is given emphasis. Comprised of seven chapters, this book begins with a discussion on the role of self-disclosure in intimate relationships as well as the risks that individuals incur when they self-disclose. The next chapter presents a cognitive interaction model of the nature of intimacy and intimate relationships within the context of cognitive-social learning theory and a systems theory approach to communication. The effect of people's motives on relationships is then considered, together with the role of two fundamental human motives - power and intimacy - on love and friendship. The remaining chapters focus on the importance of the identification process - that is, how people fix their own and others' identities in social interaction - in developing relationships; patterns of nonverbal exchange in close relationships; how and why loneliness occurs; and the nature of social exchange processes in intimate relationships. The book concludes with an epilogue that provides a perspective on why people may find it difficult or easy to form intimate relationships. This monograph should be a valuable resource for psychologists and sociologists. Must People Be Aware That They Are Lonely To Be Lonely?